We are just under two weeks from the start of the 2018 MLB Draft. I think this is a good time to look at the depth in the Minnesota Twins organization, by position, to see if there are areas that the team should focus on adding some depth to. Of course, in the first ten to 15 rounds, the team should really just take the players they believe have the most potential. Beyond that, there are positions that need to be filled by players that hopefully have some tools. Today, we will discuss the middle infielders throughout the system. Naturally, these are typically some very good athletes, capable of moving around the diamond as needed. As it relates to the draft, in the early rounds, it is best to believe that guys can stick at shortstop. Besides catcher, it is probably the most difficult position to play. We’ll start in the big leagues, but we’ll work our way down throughout the minor league system, including the guys in extended spring training. These rosters are as of this moment, so the list is subject to change at a moment’s notice. Jorge Polanco was the shortstop that we were all very excited about coming into spring training. He was arguably the Twins best hitter over the season’s final two months. Unfortunately, less than two weeks before the season started, Polanco was given an 80-game suspension for PEDs. He should return to the lineup in early July. So, Eduardo Escobar was given the starting shortstop job to start the season. However, a couple of weeks into the season, Miguel Sano was hurt and Escobar moved over to third base. Enter Ehire Adrianza who has manned the position most of the last month. Veteran Gregorio Petit came up and has been used in a utility role. Brian Dozier is the second baseman. He’s been the team’s best player the last three years. He’s off to a slow start again this year, but the Gold Glove winner is in the lineup nearly every day. Nick Gordon finally received the promotion to Triple A and the Red Wings on Thursday. He’s been a Top 50 prospect in all of baseball since the Twins used their first-round pick on him in 2014. At AA, he’s hit for average, improved his power production, and has also improved at shortstop. He’s close. Featherston is a veteran of several season in MLB baseball and plays around the infield. The same can be said of Reginnato. Miller has also played all around the infield. He spent 2017 in Ft. Myers and then went to the Arizona Fall League after the season. He was the organizations top defensive infielder last year and spent the first half of spring training in big league camp. After starting the season in Chattanooga, he was quickly promoted to Triple A where the defense has played, but the bat has not. He may return to Double A where he should get more time at shortstop. Ryan Walker has slowly worked up the system. He has now spent most of the past three seasons with the Lookouts. He’s played mostly second base, but he’s a natural at shortstop. He’s also played third base and some in the outfield. He recently returned from the disabled list after missing some time with a knee injury. Perez was a late round pick just a couple of years ago after being a four-year starter at Virginia Tech at shortstop. He’s also played mostly at second base in pro ball. He takes incredibly professional at-bats and works counts very well. Lopez was a four-year starter at shortstop at Miami. He was promoted to the Miracle after the All-Star break a year ago. He’s spent some time on the DL this season. He’s played quite a bit at all three infield spots. Cronin played four years at Boston College. He’s solid all-around and can play all three non-first base infield spots well. Upon starting his season this year, he was one of the top hitters in the organization in April. Luis Arraez tore up his knee in the third game in 2017 and missed the remainder of the season. He came back to the Miracle a couple of weeks into the season. It took him a while to get the bat going, as you would expect, but his average is again over .200 and working its way up quickly. While he’s probably a second baseman, he has made starts at third base and shortstop this year already. Blankenhorn is one of our Top 20 Twins prospects. He has split his time between third base and second base, and even had a couple of games in the outfield. He’s produced a lot of power so far this season and been much improved with the glove. Royce Lewis was the top pick in the entire 2017 draft out of high school in California. After starting his career in the GCL, he was pushed up to Cedar Rapids. That’s where he’s started 2018. While he has slumped the last week or two, he’s still hitting over .300. As impressive, his defense at shortstop has been good. A move up to Ft. Myers could be in the near future for the barely still-just 18-year-old. Jose Miranda was the second Comp B pick taken by the Twins after the second round of the 2016 draft. He had a nice showing in Elizabethton and has experienced some ups and downs already in his first season at Cedar Rapids. He’s played more second base, but he’s also spent time at third base. He’s got good power potential. Jordan Gore was drafted a year ago out of Coastal Carolina. He’s played shortstop when Lewis is given a day off. He’s played more at second base. While he has hit ninth, the switch hitter has hit over .300 and played very good defense. While we wondered how Toby Gardenhire would get both Royce Lewis and Wander Javier into the Kernels lineup at the same time. Unfortunately, we may never know, at least not for a while. Javier re-injured his left (non-throwing shoulder) and required surgery recently. He’s immensely talented, and while it is unfortunate he’ll miss the year, hopefully it won’t mean too much long-term. Carson Crites fits a similar mold as the likes of Cronin and Perez. Late-round college picks who may not have any high-end tools, but they also have few flaws in a solid all-around game. He’s spent a little time with the Miracle this year. Rick De La Torre was considered a first or second round talent early in 2017, but the Puerto Rico native fell to the Twins in the sixth round. Montesino has been in the organization for a long time. The switch-hitter split 2017 between Cedar Rapids, Elizabethton and Ft. Myers, playing around the infield and even some in center field.Emmanuel Morel is one of the fastest runners in the minor leagues. After being injured in 2016, he performed much better in 2017 in the GCL and should move up to E-Town. Yunior Severino is also a Top 20 prospect. He became a free agent this winter after baseball’s investigation of the Atlanta Braves. The Twins signed him for $2.5 million. He’s impressive from the left and right side of the plate. While most think he’ll spend most of his time at second base, he should get time at shortstop too. Agustin Marte and Yeltsin Encarnacion are in extended spring training after playing in the Dominican Summer League a year ago. Encarnacion is 20 and has played three years in the DSL. Marte is 19 and has played there the last two seasons. There is the list of middle infielders throughout the Twins system. 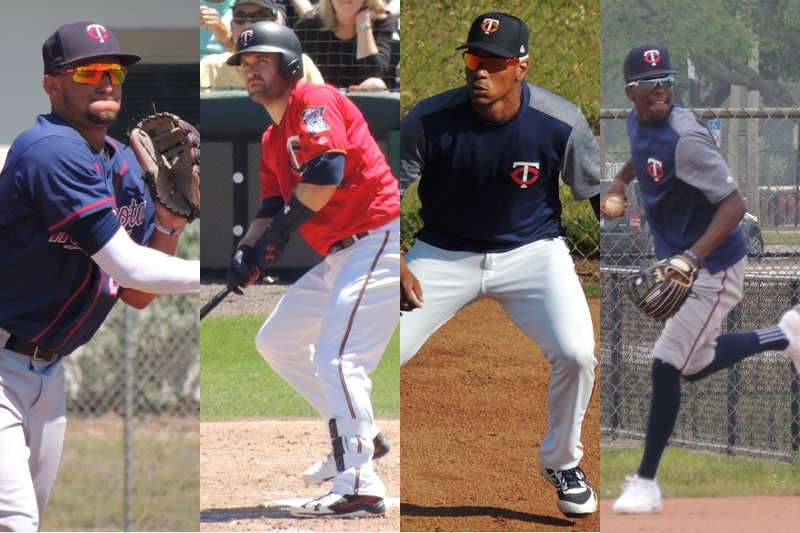 Things are pretty solid in the big leagues with Brian Dozier, Jorge Polanco (when he returns) and Eduardo Escobar. And Nick Gordon is one step away. Royce Lewis is one of the top prospects in baseball, and Wander Javier will come back in 2019. Those three players are Top 100 prospects. So, should the Twins avoid the shortstop position in the upcoming draft or in the international market? Absolutely not. Keep bringing in great athletes and baseball players and hope that you end up with a log jam. Shortstops can move elsewhere on the diamond, or they could trade excess at the position for other needs. One example is the trade of Jermaine Palacios to the Rays this spring for Jake Odorizzi. Yup. There's a couple of good looking catchers in this years draft (and from Georgia no less ), not sure how high they slot, but they are intriguing. Unlikely both Escobar and Dozier are Twins next season. Do you extend/sign one and trade the other? The trade deadline could be wild this year. I love how you got gold glove winner in there! If you had to predict, who are the SS and 2B next year in MN? I'm going Gordon at SS, and Polanco at 2B. My prediction would be Polanco at SS, Gordon at 2B... but honestly, that could go either way.If it was me, I'd try hard to sign Dozier to a 3-year deal. Weird that like 4 out of 5 comments are about catchers... That's really strange in an article with a whole bunch of words on middle infielders. If only there were some way to put something in the article title to clue readers in for what's coming. If it was me, I'd try hard to sign Dozier to a 3-year deal. Then that gives us three MI who profile best as starters at 2B, and everyone else who profile as backups (on a contender). Polanco's suspension raises a shadow of doubt for me, depending on how far back his illicit usage went during his development. If he loses just a tad of arm strength, or a smidgen of power in the bat, my amateur scouting opinion of him changes greatly. I agree with never ruling out a SS high in the draft. They are just too valuable and you never know who will pan out and stick at that position. Gordon looks MLB ready, and Lewis has the chance to advance quickly, otherwise MI help is far far away in the low minors. Plenty of talent to follow as fans, but with a long lead-time. I really don't see Dozier and Adrianza come back next season. Gordon is almost ready. Escobar is doing well. Polanco should learn the lesson. Extend Dozier and Escobar 3 years and 1-2 years respectively. Bring up Gordon and let the competition begin between him and Polanco for long term 2nd baseman job while Lewis continues to develop for the next couple years. When the Dozier string has played out, Lewis is SS, Polanco or Gordon is at 2nd, the other is the Utility infielder. Meanwhile other names have emerged and are putting pressure on the starters to excel so as to hold onto their jobs. Middle Infield future looks bright for some time to come! I'm guessing it has something to do with the depth of catching in the system. Middle infield is very deep, with lots of high ceiling guys in both the high and low minors, and while SS can move, you don't see many moving to catcher. I do hope the team drafts heavy on HS pitching and catching as well as college catching this draft. We are in catcher panic.Castro will be back.Take a catcher if that is the best player available.The Middle infielders look less imposing than I expected.When Javier comes back I see three real potential players - that is not much.Gordon should be up now.Lewis the end of next year.Dozier gone, Polanco a question mark - I do not always expect players to come back and be what they were - especially when Polanco had only a good half year.I would take some more infielders and actually lean towards 3B.